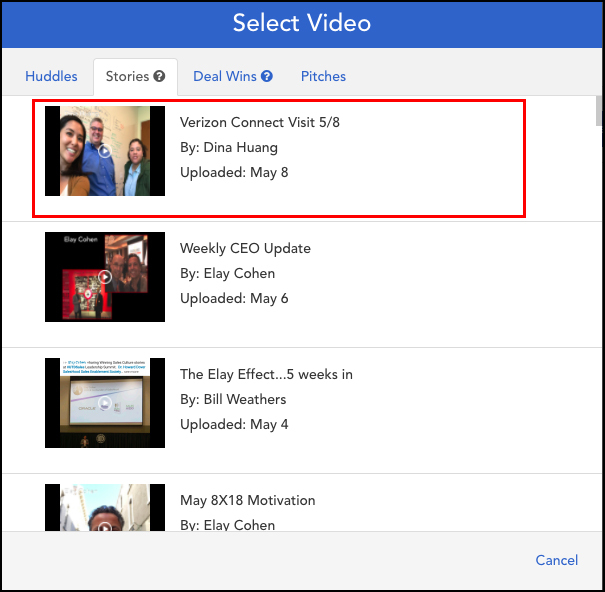 Being able to capture goals, successes, accomplishments, and stories using video is a great way to engage your teams and build culture. Video storytelling is an important component in SalesHood that supports how teams are able to share knowledge and best practices. 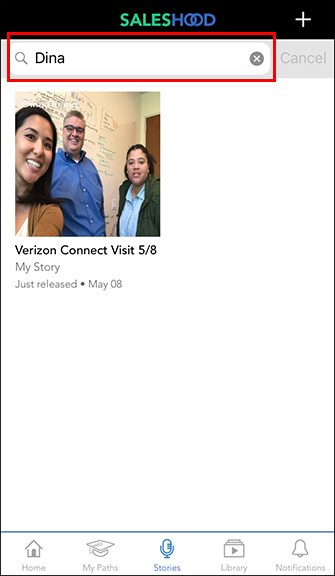 SalesHood’s Stories Recorder enables easy mobile recording with image overlays (such as slides or pictures that are captured in-field) that can add a richness to the story. People in your organization will be able to create meaningful and dynamic videos about their accomplishments and work, which are then transcribed, tagged, and added to a dynamic video library within SalesHood. By crowdsourcing the experiences and cultural cues throughout your company, these stories reinforce the connections that will accelerate employee and partner engagement by capturing company moments at scale. To record a Stories video, first ensure that the SalesHood mobile app is downloaded onto your camera-equipped mobile device. 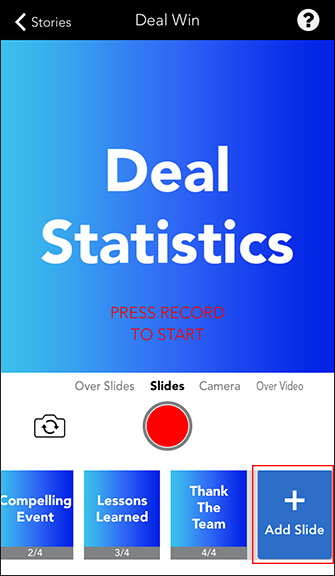 Deal Win stories use customized guided interview questions that prompt people to share structured answers to a deal they recently closed. 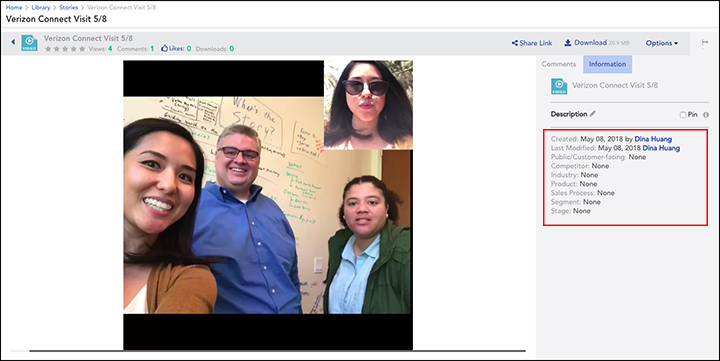 Being able to watch the top performers in your organization explain how they won deals–then facilitating that video as collaborative content for the broader organization–allows companies to leverage different processes for success. Note: At any time, you can tap the page to continue the instructions or tap the Skip option at the bottom of the page to bypass the instructions. If you would like to bring back the instructions, tap the ? icon at the top right of the page. 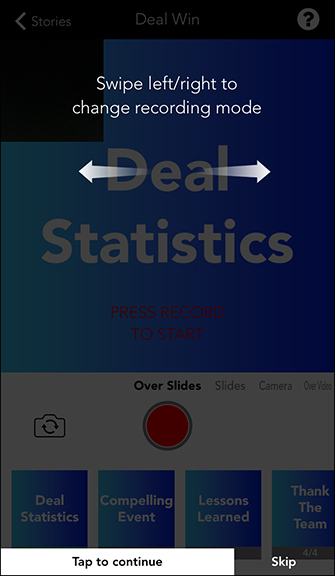 Over Slides – The Over Slides option places your camera view at the corners of the slides using either a front-facing (selfie) view or the rear-facing view. The video box can be clicked and dragged to any corner of the slide window. This option allows the active slide to stay at the forefront of the video as the person is narrating the story. 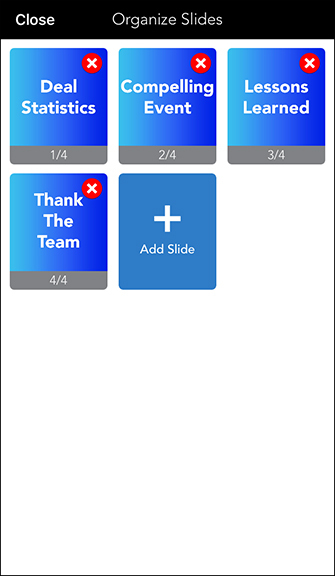 Slides – The Slides option removes the video box from the recording and keeps the active slide at the forefront. 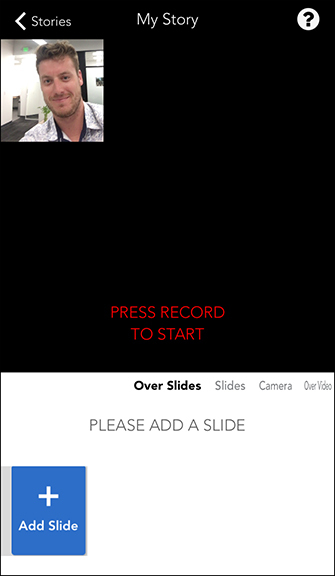 Users will swipe through the slides and use his/her talk track to narrate the video. Camera – The Camera option removes the slide from the video and allows the user to record him/herself talking while in the front-facing view, or to narrate what is being recorded from the rear-facing view. 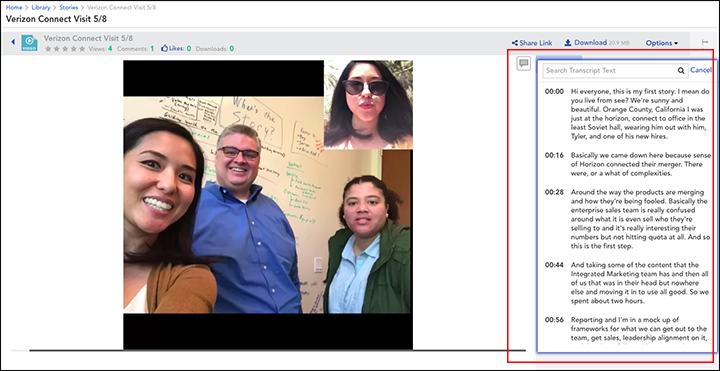 Over Video – The Over Video option reverses the Over Slides option by placing the person’s video at the forefront with the slides at the corners of the window. The slide can be clicked and dragged to any corner of the video while the person’s video is recording. 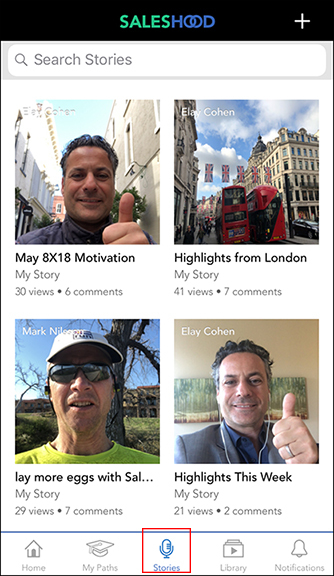 My Story stories are an authentic and personalized way for people on your team to record their videos. These stories will then be kept in the library where others will be able to share comments and encourage success on, or be repurposed for training content at a later time. To add a slide, tap the + Add Slide button at the bottom, then either choose a photo from your device’s photo library or taking a photo in real-time. 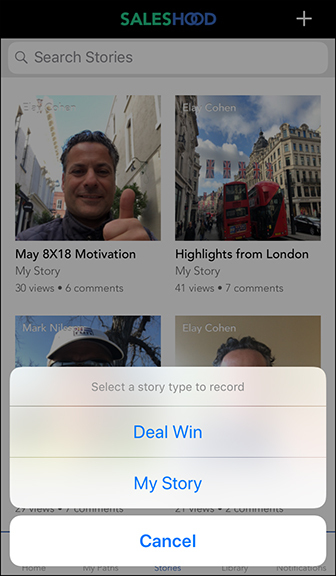 Note: The functionalities of the options to personalize the video type are the same as the ones outlined in the Deal Win stories recorder above. Once your Deal Win or My Story video has been recorded, it will automatically import as a video file in the Stories folder within your SalesHood content library. 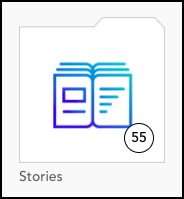 This folder is accessible on the web app by selecting Library > Stories. 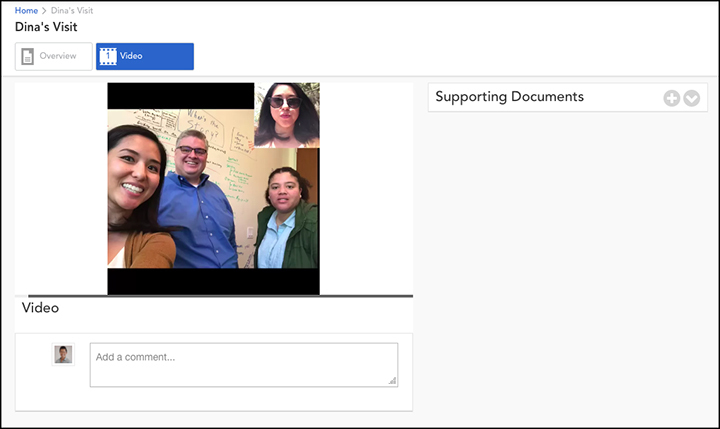 Transcribe: Automate with speech to text for all videos captured creating a library of searchable best practices. 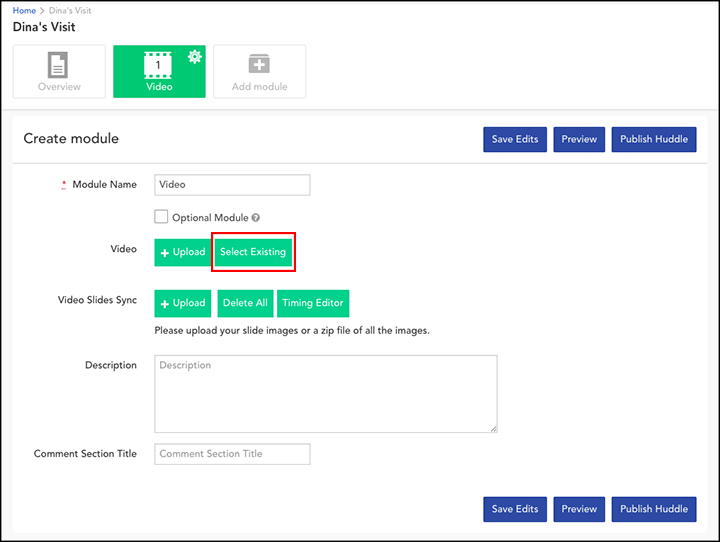 Tag: Automate how videos are shared and prescribed in context to employees and partners by tagging with keywords and custom attributes. Search: All videos are published to the company library and searchable by title, description, and text spoken in video/audio files. Measure: Analyze consumption of stories measuring views, downloads, votes, and comments to gauge impact and usefulness. Coach: Provide just-in-time and in-context coaching and content from user generated stories and experiences.